Social Media have become a great way to find and choose a restaurant. You can get information such as location, working hours and reviews from friends. Facebook acknowledges it can be a great platform to help restaurants get more business and the platform now lets restaurants display their menus directly on their Facebook pages. 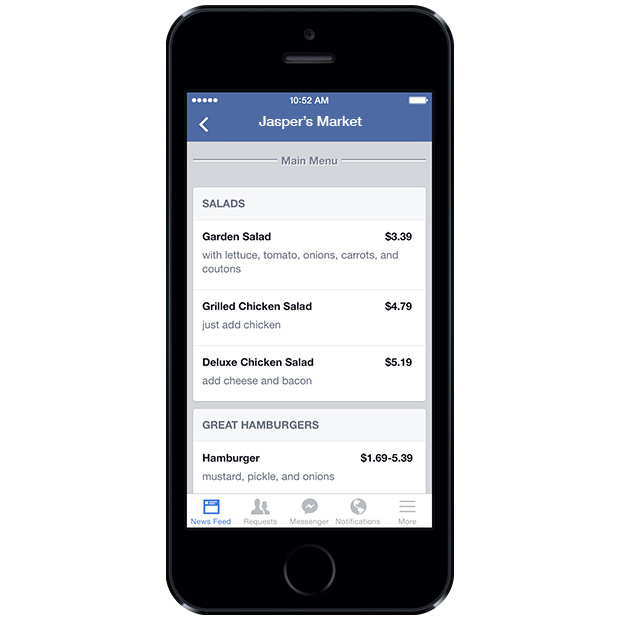 #Facebook now lets restaurants display their menus directly on their Facebook pages. The new feature will display menus on both desktop and mobile versions of Facebook and comes from a partnership between Facebook and SinglePlatform. [quote]You probably already know that Facebook is an excellent tool for engaging loyal customers and spreading the word about business activities. Having a menu easily available on Facebook is convenient for those who regularly interact with your brand there. No longer do they have to open a separate browser window or different app; everything they need is right on the local business Page. This feature is already available for restaurant pages in the US and Canada who can upload their menus via SinglePlatform, the online listings service that helps local businesses connect and engage with consumers. If you are outside the US or Canada, or if you do not currently work with SinglePlatform, worry not! Starting today, Facebook lets you upload a PDF version of your menus. For this, go to your Page Settings → Page Info → Menus. Here is how you can also upload a PDF version of you menus on #Facebook.